Keep an eye on the Forecast… it’s about to change. 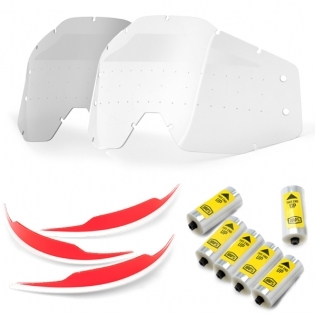 This revolutionary new film system offers the largest field of clear vision in motocross. The FORECAST is a complete system comprised of working parts that function seamlessly together resulting in the smoothest operating film system available today. By designing a complete system, we were able to engineer components that work together in unison to fight out the elements. Wider film, smoother pulls, and an advanced cleaning system contribute to achieving our goal of providing the maximum amount of vision in moto. Prevents water, dirt, mud and other elements from infiltrating the Forecast Vision System. Clear replacement lens with pre-drilled mounting holes for use with Forecast Vision System. Replacement 45mm film Rolls for use with the Forecast Vision System. A pair of Replacement Covers for the Forecast Vision System.